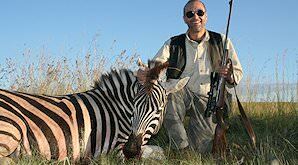 Hunting in South Africa's bushveld region can be both a challenging and rewarding experience. 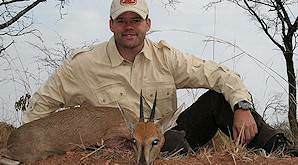 The bushveld is arguably the best and definitely the most popular of South Africa's hunting areas. 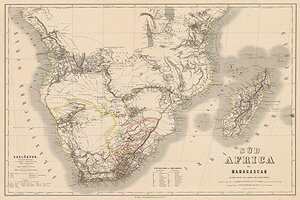 The area covers a large part of the northern and northwestern parts of South Africa, from about an hour north of the capital city of Pretoria to the South African border with the countries of Botswana and Zimbabwe. 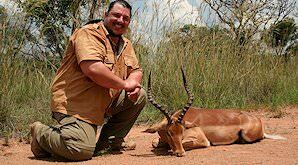 Hunting in the bushveld can be a very rewarding hunting experience. 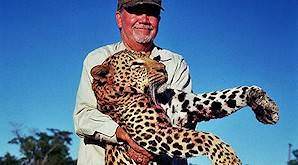 Trophy animals available range from your typical plains game prevalent throughout South Africa to dangerous game like the Big Five and hippopotamus. The tiny klipspringer is also available in the rocky koppies of this area. The camps we utilize in the bushveld region are a drive of between one and a half and four hours from OR Tambo International Airport in Johannesburg. If your flight arrives before 11:00 am, we will make our way directly to the hunting camp. If, however, the arrival is later in the day, a connecting night will be spent in Pretoria. The bushveld region is best hunted during the autumn, winter and early spring months from the middle of April to the middle of September. Whilst hunting the region in the summer months is possible and we frequently do hunt in the bushveld during these months, it should be mentioned that it can be extremely hot, and that the region experiences late afternoon thundershowers during this period. The Free State would be a better choice around this time. 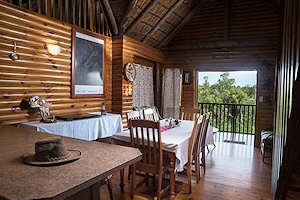 Depending on the specific hunting camp, day trips can be made to Sun City, the Cullinan Diamond Mine, the Lesedi Cultural Village as well as to the cities of Pretoria and Johannesburg and the attractions that they offer. Non-hunters can also enjoy open 4X4 game drives in either the Dinokeng, Marakele or Welgevonden game reserves. 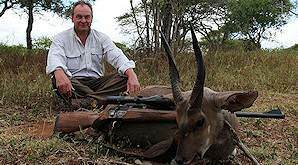 There is an extra cost involved in activities that are not part of the hunting safari. For the most part, the region consists of undulating terrain characterized by varying degrees of wooded savanna. 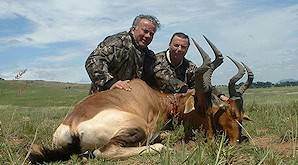 The region is very picturesque and, in the author's opinion, the finest of the hunting areas of South Africa. 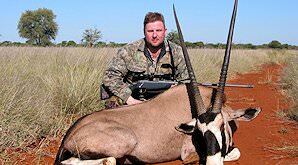 Blesbok can be hunted throughout all the provinces we offer hunting safaris to in South Africa. This medium-sized white-faced antelope is mostly found in areas with open plains and grassland. 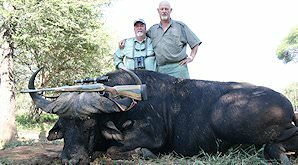 Cape buffalo are legendary among hunters for the danger factor involved. 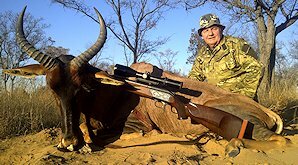 This member of the Big Five may be a bovine specie, but its unpredictable nature, size and weaponry make it a fierce foe. 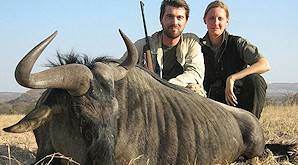 Blue wildebeest are found throughout most hunting concessions in southern Africa. Both sexes of these peculiar-looking 'beests' carry horns, but bulls are substantially larger, typically weighing around 70kg (154 lbs) more than cows. The bushbuck is a shy, medium-sized antelope that, as his name implies, prefer thickly wooded riverine forests and thickets. They are the smallest of the spiral-horned antelope species. Bush pig are an aggressive species of wild pig that can be hunted throughout Southern and East Africa. 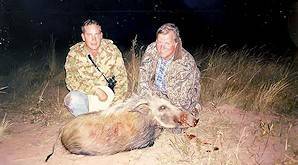 Nocturnal in nature, an evening bush pig hunt can be a wonderfully thrilling occasion. Grey duiker may be small, but this antelope's keen senses make it quite difficult to corner. 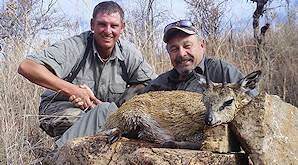 If a grey duiker's horns extend more than an inch past its ears, you are looking at a very decent trophy. These extraordinarily large antelope are clearly distinguished by their immense size. 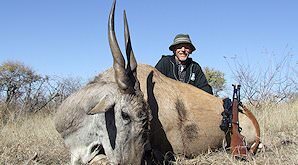 In a stark comparison, while roan antelope bulls (second largest in southern Africa) weigh between 242-300kg, eland bulls average between 400-942kg! The giraffe's cautious disposition and keen senses make it a challenging target. 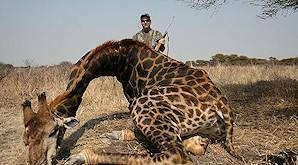 Giraffe can be hunted by spot and stalk or tracking, as this large ruminant has a very distinctive spoor. Though typically desert dwellers, gemsbok are available for hunting in other areas of southern Africa due to the development of wildlife and hunting concessions. 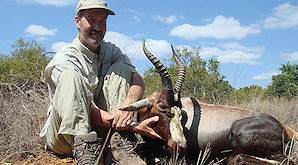 Gemsbok are hunting 'favorites' for their immense horns. Impala have been nicknamed the 'McDonalds' of the bush, partly due to the 'm' marking on their backsides, but mostly because they are choice, easy prey and widely available for the bushveld's predators. While side-striped jackal are more prevalent in northern Namibia, Botswana and Zambia, black-backed jackal occur throughout South Africa and will typically be the chance trophy you take during a hunting safari. The Afrikaans word 'klipspringer' translates to 'rock jumper', which is literally what a klipspringer does. This little antelope will typically be found in rocky areas. His ticked salt-and-pepper coat ensures that he camouflages well. 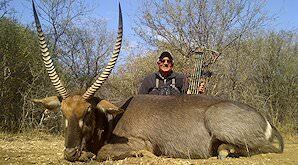 The greater kudu is one of Southern Africa's favorite plains game trophy species. Its unique markings and majestic spiral horns have rendered it an iconic symbol for wildlife in this part of the world. Though the smallest of the Big Five, the leopard is by far the most elusive and difficult to hunt! 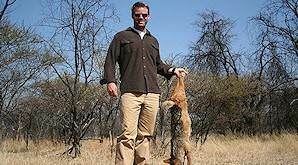 Hunters may spend hours hiding in wait for this big cat to take the bait. Patience is key when hunting leopard. The fluffy, spiral-horned nyala boasts spectacular features that make for a fantastic trophy. The bulls reach an average shoulder height of 110cm while horns typically range between 60 and 83cm (24 - 33 in). Do not be fooled by this peculiar-looking, long-faced antelope. 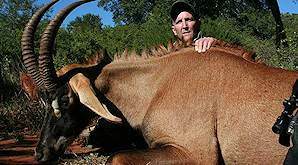 Red hartebeest are reputed to be the fastest antelope in Southern Africa. Nicknamed the 'Harley Davidson', this 'beest' will make a fine trophy. Roan antelope are named for their reddish-brown coloring. 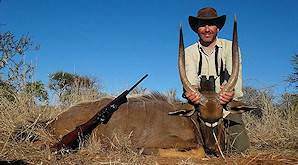 The second largest antelope in Africa, the roan antelope is a fine trophy to take on a South African hunting safari. The world's largest bird can also be hunted in southern Africa. 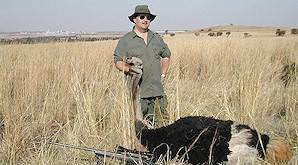 Male ostriches boast attractive black feathers and reach between 2.1 and 2.8m (6ft 11 tot to 9ft 2) and 145kg in weight. 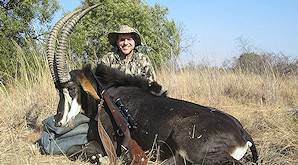 Sable antelope are the second longest antelope after the kudu. Both female and male sables carry horns, but the bulls' horns are significantly larger and more impressive. 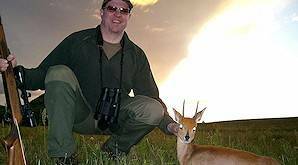 These small antelope make beautiful full mount trophies. Though typically browsers found in bushy areas, steenbok may often graze on freshly sprouted grass. They will lie flat in long grass to avoid detection. The tsessebe is reddish brown in coloring with patches of black on its face and the lower half of its body. Both sexes carry horns and reach around the same height, but males are significantly heavier than females. Waterbuck, as their name implies, are usually found near water sources such as dams and rivers. 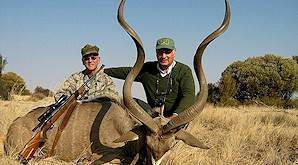 They are considered large antelope, with bulls reaching over 1m in shoulder height. 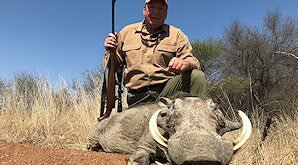 Warthog are popular trophies on hunting safaris in Southern Africa. They are named for the wart-like protrusions that feature on their faces. These wild pigs can reach 70cm at shoulder height and weigh in at an average 100kg in males. Burchell's zebra, also known as the plains zebra, enjoy grazing in open woodlands and grassland savanna. Zebra are highly dependent on water and will thus graze in an area where a water source is nearby.